The Canopy theory is a now largely discredited model originally developed as an explanation for the source of the flood water that covered the Earth during the Biblical flood. Henry Morris once promoted the canopy theory as the most probable source of the global flood waters, citing a number of supporting factors in both The Genesis Flood (1961) and The Genesis Record (1976). Still, the Bible obviously states in Genesis 7:11 (NKJV) that "on that day all the fountains of the great deep were broken up, and the windows of heaven were opened." So then, the supposed "canopy" or "firmament" was not the only source for the flood water, but the "fountains of the great deep" was also a considerable source, possibly the more important. Thus the theory according to which the supposed "canopy" was the only source for the flood waters was clearly wrong when confronted with Scripture, not to mention the fact that "a vapor canopy holding more than two meters (7 feet) of rain would cause the Earth’s surface to be intolerably hot, so a vapor canopy could not have been a significant source of the Flood waters" , hence "the fountains of the great deep". Fossil plants and animals in polar regions, indicating globally uniform temperatures before the flood. Tremendous decline in human life expectancy following the flood. Perhaps spurred by Carl Baugh's newly patented hyperbaric biosphere in 2001, scientists discovered that hyperbaric experiments actually do reproduce the giant insects of ages past through imitating ancient earth's hypothetical higher oxygen levels (30-35% compared to 21% level today), giving serious credence to the long-time Creationist claim that a vapor canopy resulted in higher oxygen levels and thus gigantism. Before the flood, human lifespans were approximately 10 times our current expectancy. Also, the overall size of organisms, and the productivity of ecosystems, was generally much greater before the flood than after. Various regions of the Earth now perpetually glaciated, such as Antarctica, possess fossil evidence of rich ecosystems, including fossil ferns and amphibians with skulls measuring up to one meter. Productivity in these regions could only be explained by global temperature fluctuations or continental drift. 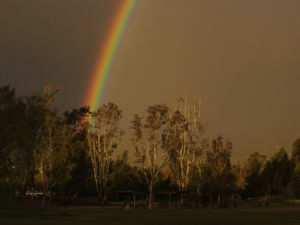 There are other indicators of an atmospheric change resulting from the flood, such as the sudden appearance of a rainbow following the flood, and the fact that human life expectancy declined to what it is today in just the few generations after Noah. Likewise the first mention of clouds is not until after the deluge, and many believe there was no rain or clouds beforehand. However, from the Bible it is clear there were stars also visible before the flood, therefore any supposed canopy was less dense than the standard cloud cover today. Since water vapor has the ability both to transmit incoming solar radiation and to retain and disperse much of the radiation reflected from the earth’s surface, it would serve as a global greenhouse, maintaining an essentially uniformly pleasant warm temperature all over the world. With nearly uniform temperatures, great air-mass movements would be inhibited and windstorms would be unknown. With no global air circulation, the hydrologic cycle of the present world could not be implemented and there could be no rain, except directly over the bodies of water from which it might have evaporated. With no global air circulation, and therefore no turbulence or dust particles transported to the upper atmosphere, the water vapor in the canopy would have been stable and not precipitate itself. The planet would have been maintained not only at uniform temperatures but also at comfortable uniform humidities by means of daily local evaporation and condensation (like dew, or ground fog) in each day-night cycle. The combination of warm temperature and adequate moisture everywhere would be conducive later to extensive stands of lush vegetation all over the world, with no barren deserts or ice caps. A vapor canopy would also be highly effective in filtering out ultraviolet radiations, cosmic rays, and other destructive energies from outer space. These are known to be the source of both somatic and genetic mutations, which decrease the viability of the individual and the species, respectively. Thus the canopy would contribute effectively to human and animal health and longevity. Some have objected to the idea of a heavy vapor canopy because of the great increase in atmospheric pressure which it would cause at the earth’s surface. Rather than being a problem, however, this effect would contribute still further to health and longevity. Modern biomedical research is increasingly proving that such “hyperbaric” pressures are very effective in combating disease and in promoting good health generally. There should be no problem in organisms living under high external pressures, provided their internal pressures had time to adjust correspondingly. Later, when needed, these upper waters would provide the reservoir from which God would send the great Flood, to save the godly remnant from the hopelessly corrupt population of that day (the content of water vapor in the present atmosphere, if all precipitated, would cover the earth only to a depth of about one inch). The original canopy theory proposed the existence of a dense vapor canopy, which fell during the 40 day rain. While the existence of a vapor canopy remains theoretic, it is unquestionable that our world was tremendously affected by the flood, and the catastrophe resulted in or was caused by atmospheric changes. Some speculate that Genesis 1:6-7 is referring to a vapor canopy that collapsed during the flood, but beforehand protected the earth, providing atmospheric stability, and globally uniform temperatures that no longer exist. The crystalline canopy is envisioned as a clear flexible shell that surrounded the earth (not to be confused with a Dyson sphere) as a blanket of polarized hydrogen ice crystals that formed a huge magnetic shield. There are three proposals for how the canopy fell. Since the canopy is polarized by the earth's magnetic field, a sudden polar flip would make it fall. A meteor impact would have destroyed the canopy. Eventually, serious problems were found with the hypothesis. Larry Vardiman modeled a vapor canopy and found that it was far too good a greenhouse generator: a canopy thick enough to provide 40 days of rain made the Earth too hot to be livable. Russell Humphreys noted that the waters are above the firmament, but the stars are in the firmament, and created a cosmology that put the "waters above" beyond the stars. Others noted that Noah's naming implied that the pre-Flood world was no idyllic paradise, while genetics did a better job of explaining the drop in lifespans than a change in the environment. ↑ Morris, Henry M., The Genesis Record. Grand Rapids MI: Baker Books, 1976. p.191. Choi, C.Q. (2006, October 10). "More Oxygen Could Make Giant Bugs." LiveScience. ↑ Stratton, C. (2010, October 29). "Raising Giant Insects to Unravel Ancient Oxygen." The Geological Society of America.Also at ScienceDaily. ↑ BBC News Devon (2011, August 4). "Plymouth Scientists' Oxygen 'Key' to Gigantic Insects. ↑ 11.0 11.1 Morris, Henry M., The Genesis Record. Grand Rapids MI: Baker Books, 1976. p.60. ↑ Brian Thomas, M.S. 2016. What Were the 'Waters Above the Firmament'?. Acts & Facts. 45 (5). This page was last modified on 11 May 2016, at 08:25.